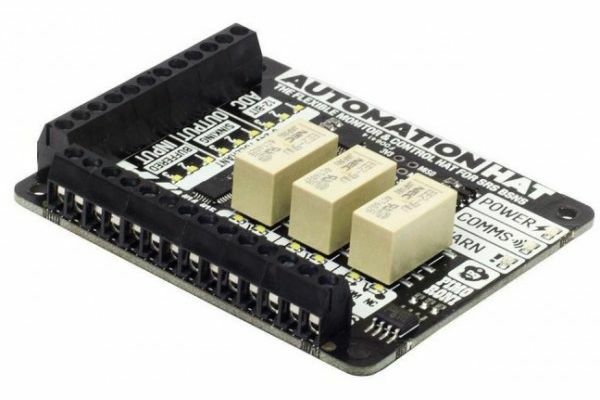 Take control of and monitor your world with our ultimate jack-of-all-trades Raspberry Pi HAT! Pimoroni pulled together a great set of features into this home monitoring and automation controller. With relays, analog channels, powered outputs, and buffered inputs (all 24V tolerant) you can now hook up a plethora of goodies to your Raspberry Pi all at once. Better still each channel has an indicator LEDs which means at a glance you can see what's happening with your setup. Even the analog channels have dimming LEDs that allow you to see the value they are currently sensing - swish! Ideal for smart home and automation projects, giving your greenhouse intelligent sprinklers, or scheduling your fish feeding! As ever, Pimoroni made a super-simple to use Python library to take advantage of Automation HAT's multitudinous functions, with examples to get you started. Our input, output and relay examples show you how to read the analog and digital inputs, switch the outputs on and off, and control the relays. Pimoroni software does not support Raspbian Wheezy. - The sinking outputs can sink a maximum 500mA total across the 3 outputs, so if you use a single channel you can sink the whole 500mA across it. - The accuracy of the ADC is ±2%. - Do not use to switch mains voltages!